Our band of worthies continued their quest for Haworth's treasure. Happy that everyone made it safely back from their encounter with the stranded sailors and 60 gold coins richer, Captain Beefheart decided to keep the captured sailors as crew on a "probationary" status. He also warned them that if they were called to make landfall and balked, he'd personally throw them overboard. Argh, indeed! 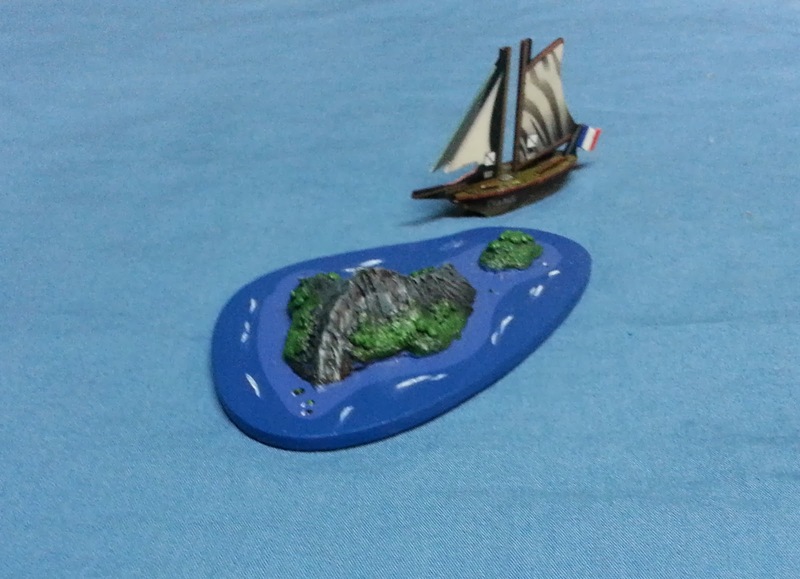 The ship (it has yet to be named by the Captain, although The Skidmark was jokingly bandied about as an option) made its way through ever-shifting winds and finally was able to land the crew on an island in the Northwest sector of the archipelago. Landfall. 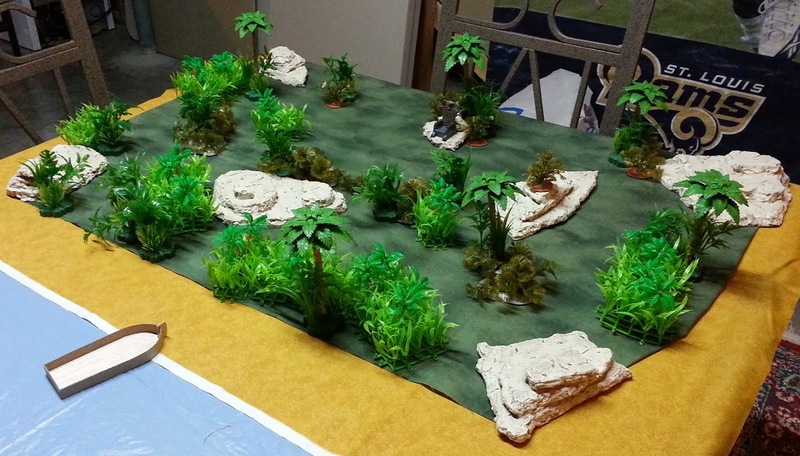 The islands are out of scale representations. There's a beach out of shot, on the far side of the island. As the Captain was absent from the party, a courageous sailor became the de facto "leader" by vote of those in the rowboat. As landfall was made, nothing seemed amiss. Exploration inland opened out to a jungle glade. In this open area was a throne on top of a rock, with a 'fancy' gorilla standing and waiting for the crew. To the party's surprise, the gorilla, aptly named Grodd, talked! He explained that he had been aboard a French vessel, headed to some unknown port as a creature of curiosity for the idle rich. The ship had met with foul weather, foundered and washed onto this island. For some reason particular to this strange archipelago, Grodd got smarter and learned to speak English and French from the remaining sailors. 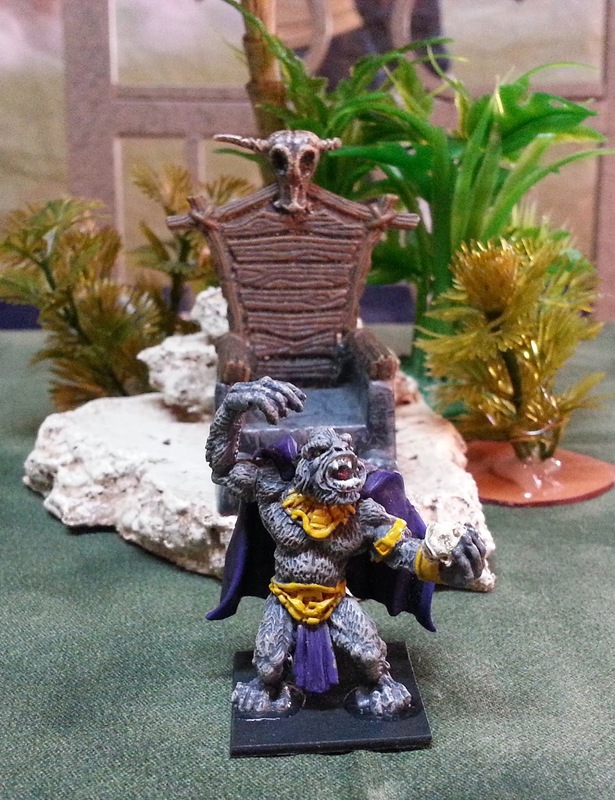 I had the de facto leader (played by Ken) make an opposed Swashbuckling roll vs Grodd. He failed. Grodd then explained that it was a shame that he had to eat the human crew and that if our group of explorers wanted to leave the island alive, they had to sacrifice half of the landing party as payment. Ken decided to "shoot the monkey in the face". Thus started the combat. Apes started pouring out of the jungle. 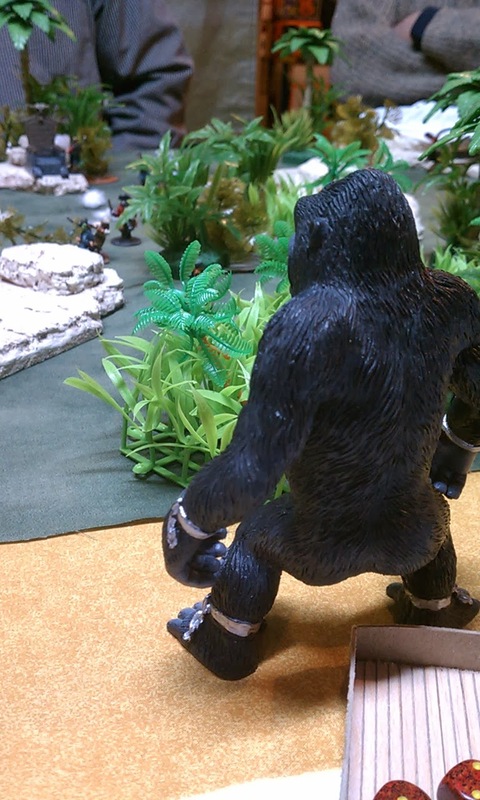 Grodd was taken down in a hailstorm of lead and flashing steel, but that didn't seem to faze the rest of his pack. At first, the apes moved slowly toward the group, allowing the crew to move toward the boat and the safety of the ocean, but I did manage to move Bobo the giant gorilla in front of the rowboat. Bobo heading off the party, backside firmly hovering over the rowboat. Apes started moving faster toward the group and attacking with ferocity. They managed to take down the two 'redshirt' sailors and a more 'seasoned' character played by Jon Mark. Poor Bobo was literally shot off his feet, landing in and crushing the rowboat. The party then peppered him with pistol fire and stabbed him with swords until he died. With the death of Bobo, the other apes fled into the jungle. It was a victory for the group, but a costly one. Three party members down. Of those, two died. Jon Mark's character had been rendered unconscious, but was okay to fight another day. All in all, it was a good night. Flashing Steel is a fun system and I'm having a great time shaping it into a high adventure campaign. The apes. 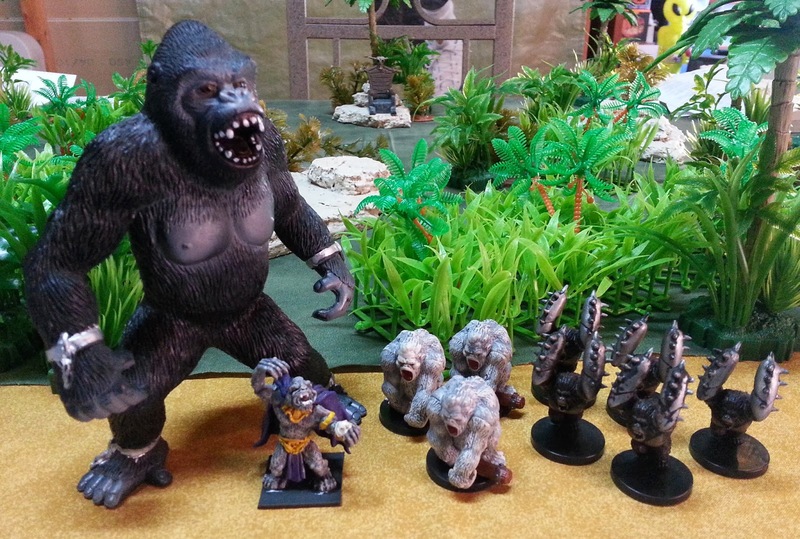 Bobo was a dollar store buy, Grodd is a Heroclix figure and the rest are D&D minis. Get me off this island!! !